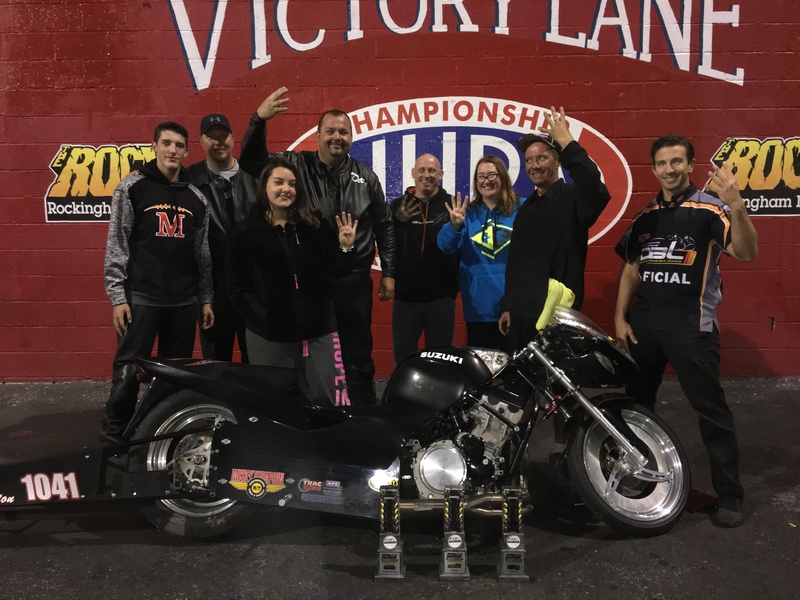 Rockingham Dragway owner Steve Earwood called the IDBL World Finals, Nov. 3-5, the best all-motorcycle race the Rock has seen in more than 15 years. Hundreds of competitors congregated in the sandhills of N.C. for the much-anticipated season finale. 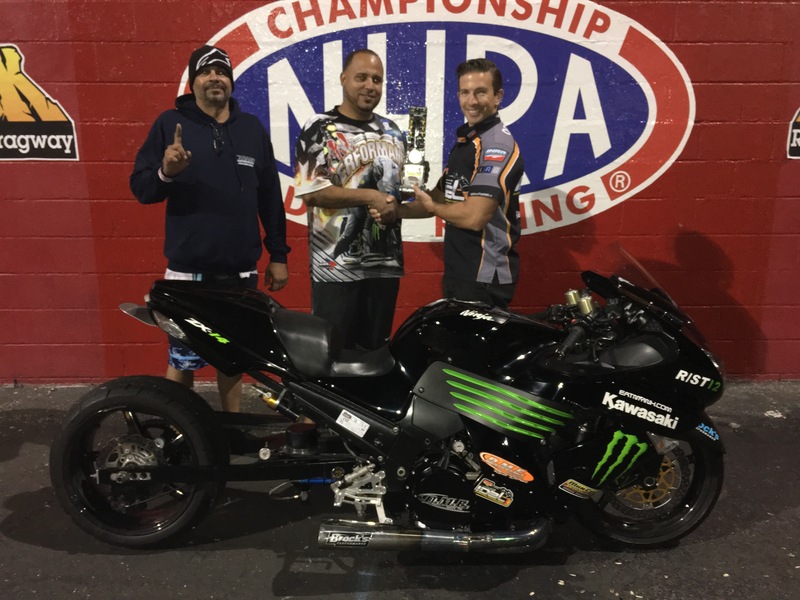 The only thing able to stop an indomitable Dale Hamilton during the International Drag Bike League World Finals at Rockingham Dragway was Sunday night fog so thick that it obscured the Christmas Tree starting system and forced the cancelation of the final seven races of the show. 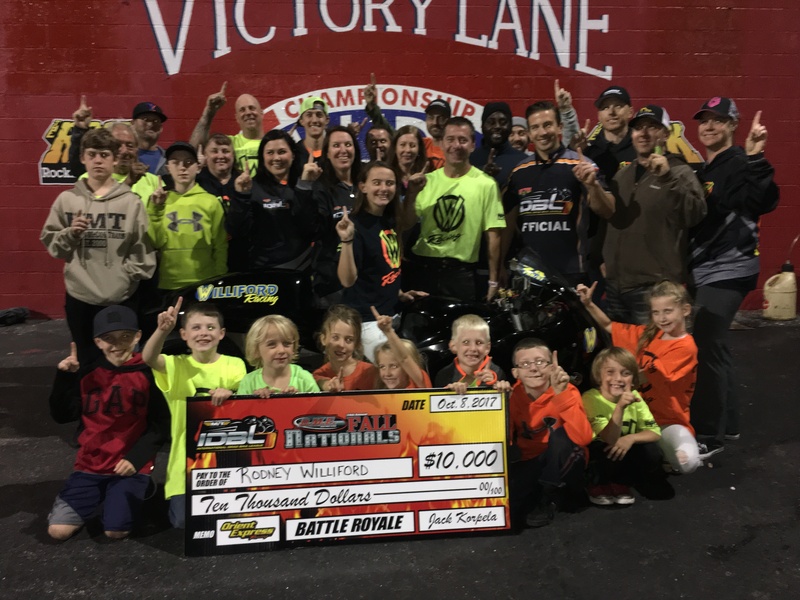 Hamilton was one of four two-wheel bracket racers still in contention for a $10,000 winner’s purse in Sunday’s feature event when the weather intervened. As a result, the Mount Airy, Md., rider had to settle for splitting the winner, runner-up and semifinal money with three others including his brother Kevin. The other two sharing in the bounty were Matt Davies of Petersburg, Va., and Luis Reyes of San Juan, Puerto Rico. Otherwise, it was all Dale Hamilton-all-the-time at The Rock. The Maryland rider won Pro ET on Friday, won Pro ET on Saturday and won the Pro ET Tournament of Champions on Sunday. That, coupled with his performance in the $10,000 race, would have earned him the MVP award, hands down. 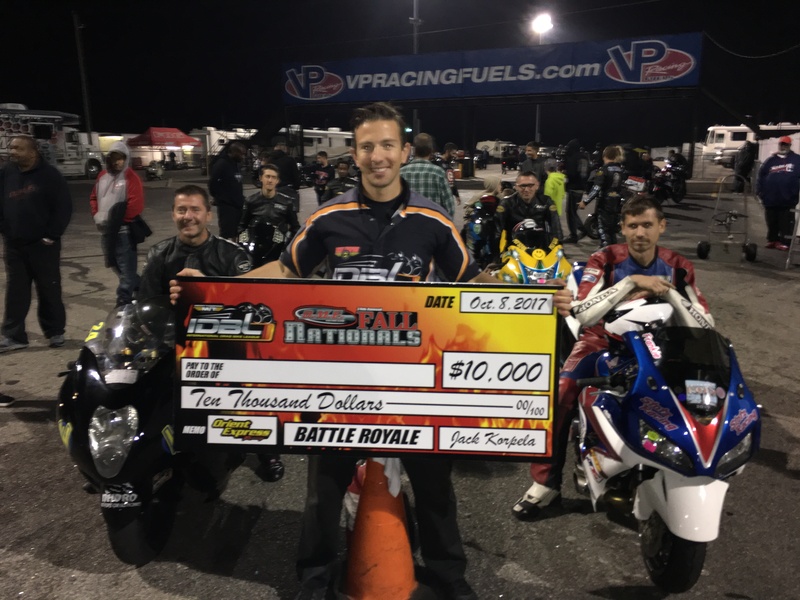 Other winners included Ehren Litten of Louisburg, who won Sunday’s Pro Street title after many-time MIRock Superbike Champion Rodney Williford of Rougemont prevailed on Saturday in the $10,000 Battle Royale; T.T. 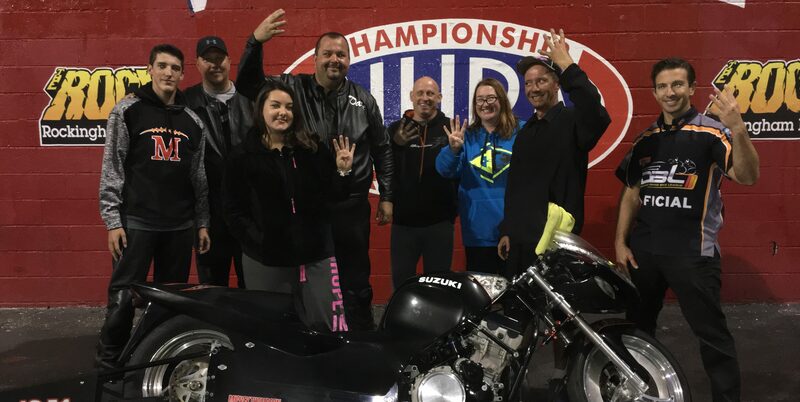 Jones of Huntsville, Ala. in Pro Mod; Boo Brown of Potomac, Md., who won the 4.60 class beating Tim Shelton of Hardy, Va., in the Sunday final and Jeremy Teasley, the most successful rider in Rockingham history, who won the 5.60 Index class. Although Concord’s Anibal Merced won Real Street, Eddie Chapman came away with a national record in the class at 7.682 seconds. Dustin Lee of Morristown, Tenn., and James Farmer of Ellendale, Del., were the winners in the Street ET Tournament of Champions and Top Sportsman, respectively, and Durham’s Stephen Knight was among the Street ET winners. 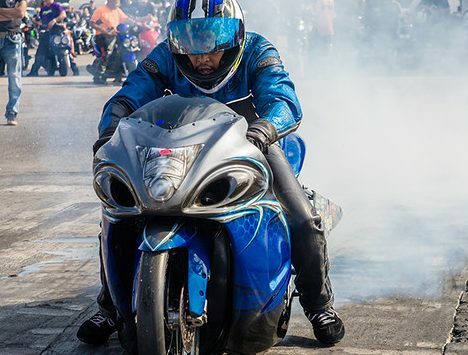 A total of 407 bikes raced in the event, 150 of them in the $10,000 ET Showdown. 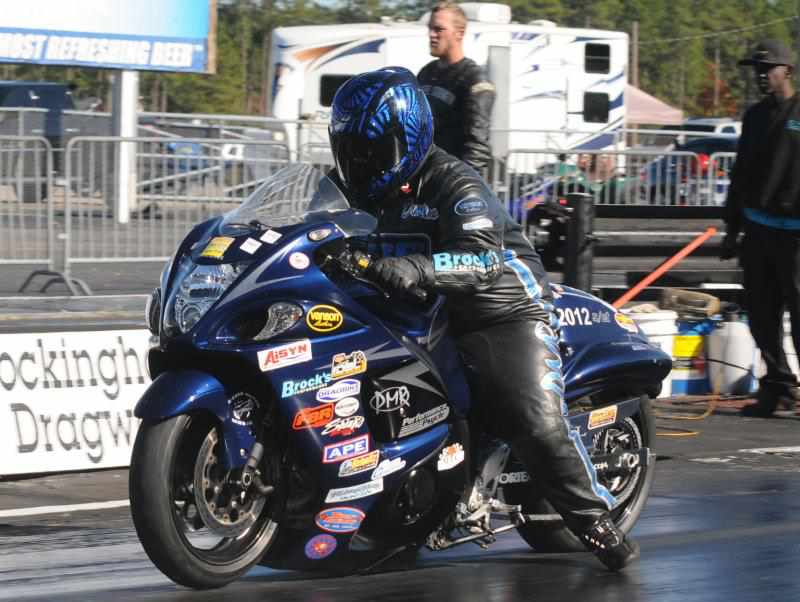 Round 5 – Barry Pryer, Chesapeake, Va., .069, 12.569 on a 12.500, 103.83 mph, def. Michael McAllister, Jacksonville, foul; Scottie Keller, Mooresville, .133, 9.975 on an 8.870, 135.44 mph, def. Darrell Aubin, Corinth, N.Y., .055, 9.658 on a 9.450, 136.72 mph; Pablo Gonzalez, Carolina, Puerto Rico, .063, 9.548 on a 9.510, 141.88 mph, def. Unknown #1077, foul; Spencer Claycomb, Rockport, Tenn., .156, 8.937 on an 8.910, 146.72 mph, def. Barry Purnell, Henderson, .0129, 9.316 breakout on a 9.350, 140.53 mph; Kevin Hamilton, Mount Airy, Md., .036, 8.067 on an 8.030, 152.64 mph, def. Michael Herman Jr., Woodbridge, Va., .080, 9.168 on a 9.150, 147.46 mph; Ben Knight, Elkton, Va., .049, 8.754 on an 8.720, 153.65 mph, def. Derrick Milbourne, Manassas Park, Va., .068, 8.890 on an 8.870, 151.90 mph; Dana Mack, Woodbridge, Va., .069, 9.078 on a 9.050, 140.37 mph, def. Stanley Russell, Gray, Ga., .050, 9.871 on a9.800, 134.71 mph; Luis Reyes, San Juan, Puerto Rico, .015, 9.342 on a 9.280, 139.43 mph, def. Ronnie Procopio, Wake Forest, .044, 8.424 on an 8.340, 152.45 mph; Luke Boykin III, Kill Devil Hills, .051, 9.664 on a 9.650, 137.61 mph, def. Wardell Pinkney, Sterling, Va., .120, 9.620 on a 9.430, 139.08 mph; Dustin Lee, Morristown, Tenn., .036, 8.760 on an 8.780, 143.35 mph, def. Jeremy Brown, Stafford, Va., .013, 8.698 breakout on an 8.730, 150.56 mph; Stephen Knight, Durham, .034, 9.246 on a 9.210, 146.91 mph, def. Alan Fields, Climax, foul; Mike Schulz, .049, 8.978 on an 8.950, 147.31 mph, def. Kevin Adams, .158, 8.595 breakout on an 8.680, 151.26 mph; Matt Davies, Petersburg, Va., .059, 8.758 on an 8.640, 131.20 mph, def. Tylan Beckelheimer, Mt. Sterling, Ohio, .140, 10.004 on a 9.200, 126.05 mph; Dale Hamilton, Mount Airy, Md., .001, 8.597 on an 8.530, 152.74 mph, def. Boo Brown, Potomac, Md., .027, 8.802 on an 8.740, 151.34 mph; Randy Day, Anderson, S.C., .064, 9.024 on an 8.900, 149.98 mph, def. Robin Procopio, Wake Forest, .028, 8.445 on an 8.260, 127.19 mph. Round 6 – Mack, .068, 9.099 on a 9.050, 145.34 mph, def. Pryer, .027, 12.653 on a 12.550, 104.07 mph; Gonzalez, .032, 9.528 on a 9.510, 142.37 mph, def. Ben Knight, .054, 8.696 breakout on an 8.720, 154.97 mph; Keller, .059, 8.878 on an 8.870, 150.26 mph, def. Stephen Knight, .030, 9.235 breakout on a 9.240, 146.08 mph; D. Hamilton, .041, 8.036 on an 8.030, 162.47 mph, def. Boykin, foul; Schulz, .041, 8.936 on an 8.960, 151.19 mph, def. Day, foul; Davies, .017, 8.699 on an 8.650, 149.81 mph, def. Claycomb, .067, 8.923 on an 8.900, 144.64 mph; K. Hamilton, .014, 8.574 on an 8.540, 153.56 mph, def. Lee, .062, 8.766 breakout on an 8.770, 150.68 mph; Reyes, bye. Round 7 – D. Hamilton, .021, 8.070 on an 8.030, 152.90 mph, def. Schulz, .058, 8.946 on an 8.930, 150.50 mph; Davies, .021, 8.679 on an 8.650, 148.38 mph, def. Keller, .100, 8.858 breakout on an 8.870, 150.21 mph; Reyes, .040, 9.306 on a 9.270, 144.98 mph, def. Gonzalez, foul; K. Hamilton, .058, 8.527 on an 8.530, 159.55 mph, def. Mack, .082, 9.019 breakout on a 9.050, 149.27 mph. Semifinals – Racing suspended due to heavy fog. Dale Hamilton, Mount Airy, Md., Matt Davies, Petersburg, Va., Kevin Hamilton, Mount Airy, Md., and Luis Reyes, San Juan, Puerto Rico, split the semifinal, runner-up and winner’s purse. Semifinals – Teasley, .085, 6.981, 209.72 mph, def. Williford, .027, 7.559, 204.23 mph; Litten, .059, 7.345, 200.92 mph, def. Connell, .052, 16.293, 71.37 mph. FINAL – Ehren Litten, Louisburg, .074, 6.937, 208.39 mph, def. Jeremy Teasley, Columbus, Ohio, .087, 8.524, 121.97 mph. Round 3 – Mike Chongris, Eastlake, Ohio, bye; Boo Brown, Potomac, Md., .020, 4.642, 148.99 mph, def. Bobby Lovingood, Leland, .034, 4.586 breakout, 143.64 mph; Tim Shelton, Hardy, Va., NA, 5.169, 122.46 mph, def. Kenny Cornell, Manassas, Va., foul. Semifinals – Brown, .025, 4.642, 143.05 mph, def. Chongris, .090, 4.597 breakout, 146.62 mph; Shelton, bye. FINAL – Boo Brown, Potomac, Md., .033, 4.661, 139.67 mph, def. Tim Shelton, Hardy, Va., .029, 4.728, 147.13 mph. Round 3 – C.J. Fair, Lexington, S.C., .063, 5.691, 116.55 mph, def. Ronnie Hall, Albemarle, foul; Jeremy Teasley, Columbus, Ohio, .078, 5.580, 129.00 mph, def. Tyler Hall, Albemarle, .012, 5.578 breakout, 120.65 mph; Robin Procopio, Wake Forest, .044, 5.529, 120.54 mph, def. Brandon Bachmeier, Manassas, Va., foul; Dave Cornnell, Mineral, Va., .025, 5.660, 121.41 mph, def. Spencer Claycomb, Rockport, Tenn., .043, 5.639, 129.11 mph. Semifinals – Teasley, .023, 5.590, 127.71 mph, def. Fair, foul; Cornnell, .042, 5.599, 127.21 mph, def. Procopio, .051, 5.591 breakout, 116.58 mph. FINAL – Jeremy Teasley, Columbus, Ohio, .006, 5.635, 125.73 mph, def. Dave Cornnell, Mineral, Va., .051, 5.561 breakout, 125.56 mph. Round 1 – Dale Hamilton, Mount Airy, Md., .003, 8.531 on an 8.530, 157.78 mph, def. Mike Schulz, .046, 8.984 on an 8.950, 144.92 mph; Derrick Milbourne, Manassas Park, Va., .018, 8.885 on an 8.870, 150.26 mph, def. Unknown #1121, .124, 8.098 breakout on an 8.150, 160.16 mph; Brandon Bachmeier, Manassas, Va., bye; Dale Hamilton #2, Mount Airy, Md., bye. Round 2 – Hamilton #1, bye; Milbourne, .026, 8.899 on an 8.870, 147.75 mph, def. Bachmeier, .059, 8.694 on an 8.670, 154.62 mph; Hamilton #2, bye. Semifinals – Hamilton beat Hamilton, Milbourne, bye. FINAL – Dale Hamilton, Mount Airy, Md., .015, 8.607 on an 8.540, 152.06 mph, def. Derrick Milbourne, Manassas Park, Va., .064, 8.900 on an 8.860, 151.71 mph. Round 1 – Spencer Claycomb, Rockport, Tenn., .057, 8.888 on an 8.880, 145.78 mph, def. Unknown #911, .032, 9.149 on a 9.100, 146.77 mph; Darrell Mahoney, Pomfret, Md., .003, 9.074 on a 9.110, 148.28 mph, def. Unknown #324, .035, 9.238 breakout on a 9.380, 147.49 mph; Dustin Lee, Morristown, Tenn., .049, 8.851 on an 8.870, 151.02 mph, def. Unknown #257, foul; Stephen Knight, Durham, .017, 9.076 on a 9.080, 144.58 mph, def. Mike Schulz, .037, 8.917 breakout on an 8.950, 149.58 mph; Joey Devola, Ruffs Dale, Pa., bye. Round 2 – Knight, .050, 9.036 on a 9.080, 146.89 mph, def. Devola, .043, 10.484 breakout on a 10.530, 131.79 mph; Lee, .029, 8.803 on an 8.780, 146.64 mph, def. Claycomb, .048, 8.936 on an 8.920, 149.27 mph; Mahoney, bye. Semifinals – Mahoney, .031, 9.104 on a 9.070, 143.52 mph, def. Knight, .075, 9.061 on a 9.040, 137.22 mph; Lee, bye. FINAL – Dustin Lee, Morristown, Tenn., .026, 8.779 on an 8.780, 152.14 mph, def. Darrell Mahoney, Pomfret, Md., foul. Round 4 – Courtland Whiting, Triangle, Va., .129, 8.890, 146.54 mph, def. Nick Hamlet, Waynesboro, Pa., .020, 9.015, 139.98 mph; Michael Sweeney, St. Leonard, Md., .039, 8.965, 133.98 mph, def. Kevin Adams, Brunswick, Ohio, foul; Jeremy Teasley, Columbus, Ohio, .011, 8.892, 150.63 mph, def. Boo Brown, Potomac, Md., .036, 8.895, 137.85 mph. Semifinals – Teasley, .045, 8.860, 149.65 mph, def. Sweeney, .072, 8.849 breakout, 152.92 mph; Whiting, bye. FINAL – Racing suspended due to fog. Jeremy Teasley, Columbus, Ohio, and Courtland Whiting, Triangle, Va., split the winner and runner-up money. Round 6 – Wes Brown, Crossville, Tenn., .076, 8.938 on an 8.910, 144.38 mph, def. Jeff Coley, Norwood, .101, 9.955 breakout on a 9.960, 130.47 mph; Ben Knight, Elkton, Va., .025, 8.768 on an 8.700, 151.07 mph, def. Unknown #2126, .055, 9.126 on a 9.070, 148.80 mph; Derrick Milbourne, Manassas Park, Va., .054, 8.905 on an 8.860, 147.58 mph, def. Caleb Johnson, Elizabethtown, Tenn., .032, 9.788 on a 9.700, 126.96 mph; Jeremy Teasley, Columbus, Ohio, .061, 17.565 on a 9.700, 58.25 mph, def. Charles Zepko Jr., foul; Nick Hamlet, Waynesboro, Pa., bye. Round 7 – Knight, bye; Brown, .040, 8.925 on an 8.910, 147.92 mph, def. Hamlet, .087, 8.399 breakout on an 8.440, 154.23 mph; Milbourne, .034, 8.872 on an 8.890, 151.14 mph, def. Teasley, .046, 8.649 breakout on an 8.680, 152.43 mph. Semifinals — Racing suspended due to fog. Ben Knight, Elkton, Va., Wes Brown, Crossville, Tenn., and Derrick Milbourne, Manassas Park, Va., split the semifinal, runner-up and winner’s purse. Semifinals – Frankie Stotz, Schaumburg, Ill., .070, 6.797, 199.79 mph, def. Ehren Litten, Louisburg, .052, 10.972, 76.55 mph; Rodney Williford, Rougemont, .045, 6.695, 219.79 mph, def. Jeremy Teasley, Columbus, Ohio, .091, 7.092, 180.50 mph. FINAL – Rodney Williford, Rougemont, .040, 14.016, 55.03 mph, def. Frankie Stotz, Schaumburg, Ill., foul. Semifinals – Anibal Merced, Concord, .046, 7.815, 189.26 mph, def. Del Flores, Clifton, N.J., .107, 17.395, 42.21 mph; Eddie Chapman, Pocomoke City, Md., bye. FINAL – Anibal Merced, Concord, .094, 7.931, 186.43 mph, def. Eddie Chapman, Pocomoke City, Md., .135, 7.999, 191.24 mph. Semifinals – Dustin Lee, Morristown, Tenn., .042, 8.180 on an 8.120 target, 175 68 mph, def. Unknown #4141, foul; James Farmer, Ellendale, Del., .029, 8.366 on an 8.290, 148.30 mph, def. Ricardo Marte, San Juan, Puerto Rico, foul. FINAL – James Farmer, Ellendale, Del., .031, 8.416 on an 8.410, 148.30 mph, def. Dustin Lee, Morristown, Tenn., .035, 8.208 on an 8.200, 177.88 mph. Round 6 – Dustin Lee, Morristown, Tenn., .009, 8.794 on an 8.800, 146.27 mph, def. Jeffrey Santini, NA, .049, 9.252 breakout on a 9.280, 144.49 mph; Dale Hamilton, Mount Airy, Md., .055, 9.428 on a 9.400, 137.62 mph, def. James Farmer, Ellendale, Del., .030, 8.354 on an 8.300, 152.83 mph; Stanley Russell, Gray, Ga., .047, 9.786 on a 9.760, 129.29 mph, def Derrick Melbourne, Manassas Park, Va., .070, 10.360 on an 8.050, 113.28 mph; Kevin Adams, Brunswick, Ohio, .032, 9.132 on an 8.610, 165.56 mph, def. Wes Brown, Crossville, Tenn., .030, 8.869 breakout on an 8.870, 141.42 mph; Dustin Lee #2, Morristown, Tenn., .029, 9.038 on a 9.050, 148.17 mph, def. Ted Harvey, Chardon, Ohio, foul. Round 7 – Hamilton, .027, 9.401 on a 9.400, 140.85 mph, def. Lee, .020, 9.072 on a 9.040, 149.33 mph; Russell, .035, 9.770 on a 9.760, 136.00 mph, def. Adams, foul; Lee #2, bye. Semifinals – Russell, .054, 9.779 on a 9.750, 136.69 mph, def. Lee, foul; Hamilton, bye. FINAL – Dale Hamilton, Mount Airy, Md., .012, 9.402 on a 9.370, 135.78 mph, def. Stanley Russell, Gray, Ga., .044, 9.833 on a 9.760, 136.63 mph. Round 6 – Russell Dennison Jr., Youngsville, .007, 8.792 on an 8.740, 148.97 mph, def. Brandon Bachmeier, Manassas, Va, .121, 8.758 on an 8.600, 154.25 mph; Dana Meak, Woodbridge, Va., .059, 9.065 on an 8.990, 142.64 mph, def. Ricardo Marte, San Juan, Puerto Rico, .136, 8.971 on an 8.920, 152.24 mph; Stephen Knight, Durham, .095, 9.129 on a 9.120, 148.43 mph, def. Thomas Graves, Baltimore, Md., foul; Dustin Lee, Morristown, Tenn., .009, 9.043 on a 9.030, 147i.81 mph, def. Joey Devola, Ruffs Dale, Pa., foul; Wes Brown, Crossville, Tenn., .068, 8.841 on an 8.850, 149.71 mph, def. Pete Hiatt, Mount Airy, foul. Round 7 – Brown, .021, 8.875 on an 8.840, 149.93 mph, def. Meak, .023, 9.026 on an 8.990, 149.13 mph; Dennison, bye; Knight, .059, 9.098 on a 9.120, 135.37 mph, def. Lee, .038, 9.015 breakout on a 9.060, 142.00 mph. Semifinals – Knight, .018, 9.173 on a 9.120, 143.84 mph, def. Dennison, .075, 8.833 on an 8.750, 152.99 mph; Brown, bye. FINAL –Stephen Knight, Durham, .005, 9.136 on a 9.120, 134.85 mph, def. Wes Brown, Crossville, Tenn., .005, 8.848 breakout on an 8.870, 149.65 mph. Round 5 – Dale Hamilton, Mount Airy, Md., .000, 8.619 on an 8.550, 146.42 mph, def. Shayne Proctor, Indian Head, Md., .012, 9.105 on a 9.020, 146.72 mph; Jeffrey Santini, NA, .009, 9.353 on a 9.310, 132.53 mph, def. Jim Shifflett, Waynesboro, Va., .012, 8.218 on an 8.070, 157.47 mph; Ron Arnold, NA, .029, 8.777 on an 8.800, 153.35 mph, def. Nick Hamlet, Waynesboro, Pa., .071, 8.398 breakout on an 8.440, 157.32 mph; Kevin Adams, Brunswick, Ohio, .058, 8.716 on an 8.690, 154.65 mph, def. Thomas Graves, Baltimore, Md., no time; John Markham, Bowling Green, Ky., .147, 8.830 on an 8.820, 146.21 mph, def. Darrell Mahoney, Pomfret, Md., foul; Dwayne Jackson, NA, .114, 9.143 on a 9.160, 148.84 mph, def. Luke Boykin III, Kill Devil Hills, .138, 9.944 breakout on a 10.000, 112.00 mph. Round 6 – Hamilton, .017, 8.625 on an 8.550, 146.45 mph, def. Markham, .109, 8.853 on an 8.820, 141.43 mph; Santini, l.053, 9.293 on a 9.310, 143.87 mph, def. Jackson, foul; Adams, .013, 8.650 on an 8.700, 155.27 mph, def. Arnold, foul. Semifinals – Hamilton, .059, 8.569 on an 8.550, 159.46 mph, def. Santini, foul; Adams, bye. FINAL – Dale Hamilton, Mount Airy, Md., .024, 8.557 on an 8.560, 159.66 mph, def. Kevin Adams, Brunswick, Ohio, .066, 8.602 breakout on an 8.650, 160.02 mph. Round 5 – Wes Brown, Crossville, Tenn., .056, 8.920 on an 8.930, 149.30 mph, def. Scottie Keller, Mooresville, .083, 8.828 breakout on an 8.870, 148.51 mph; Mike Schulz, NA, .046, 8.962 on an 8.930, 145.45 mph, def. Ben Knight, Elkton, Va., .068, 8.768 on an 8.720, 146.45 mph; Jerry Turner, Bluff City, Tenn., .053, 9.418 on a 9.300, 130.90 mph, def. Ricardo Marte, San Juan, Puerto Rico, foul; Kevin Adams, Brunswick, Ohio, .007, 9.207 on a 9.200, 143.19 mph, def. Shayne Proctor, Indian Head, Md., .060, 9.048 breakout on a 9.060, 145.77 mph; Thomas Graves, Baltimore, Md., .104, 9.350 on a 9.330, 131.66 mph, def. Darrell Mahoney, Pomfret, Md., .071, 9.281 on a 9.110, 132.95 mph; John Markham, Bowling Green, Ky., .037, 9.475 on a 9.430, 139.26 mph, def. Joey Devola, Ruffs Dale, Pa., .052, 10.477 breakout on a 10.480, 121.51 mph. Round 6 – Schulz, .032, 8.935 on an 8.930, 145.59 mph, def. Turner, .013, 9.314 on a 9.280, 146.89 mph; Adams, .036, 9.164 on a 9.160, 140.11 mph, def. Graves, .044, 9.371 on a 9.330, 128.36 mph; Markham, .053, 9.450 on a 9.440, 140.66 mph, def. Brown, .076, 8.934 on an 8.920, 139.37 mph. Semifinals – Adams, .093, 9.220 on a 9.160, 140.11 mph, def. Markham, .127, 9.516 on a 9.440, 130.38 mph; Schulz, bye. 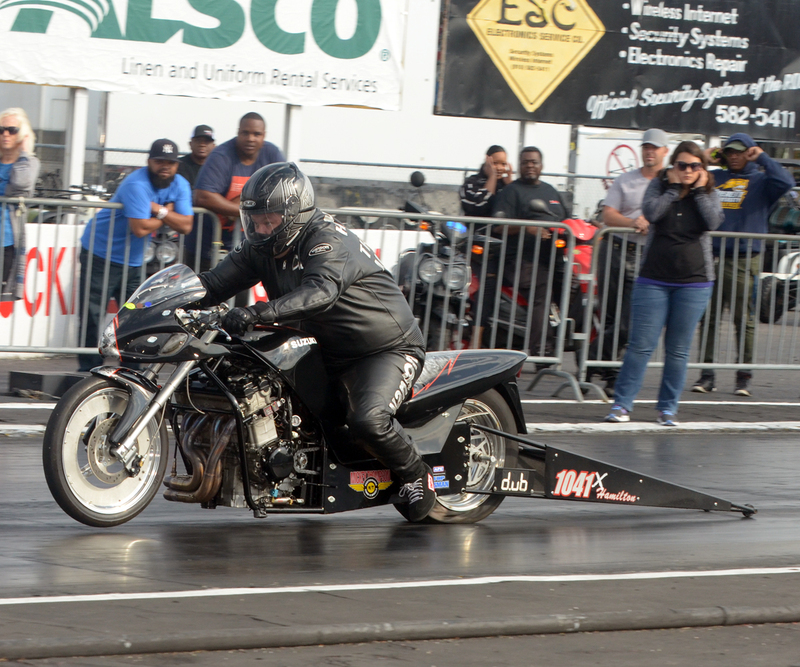 FINAL – Mike Schulz, NA, .046, 8.904 on an 8.890, 150.61 mph, def. Kevin Adams, Brunswick, Ohio, .067, 9.147 breakout on a 9.160, 141.31 mph.